From NSP - Nature's Sunshine - Supports liver cleansing function. Reduces stress, Enhances digestion. Take internally as a healing bulk laxative for ulcers and intestinal inflammation. May support the body's natural process for muscle pain and inflammation relief following exercise and massage. To soothe and clear infections and inflammation. Soothing, healing nutrient for soft tissues. 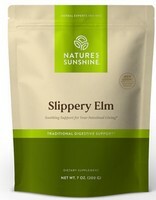 Slippery elm bark is mild-flavored and very nutritious, it has a food value similar to oatmeal.